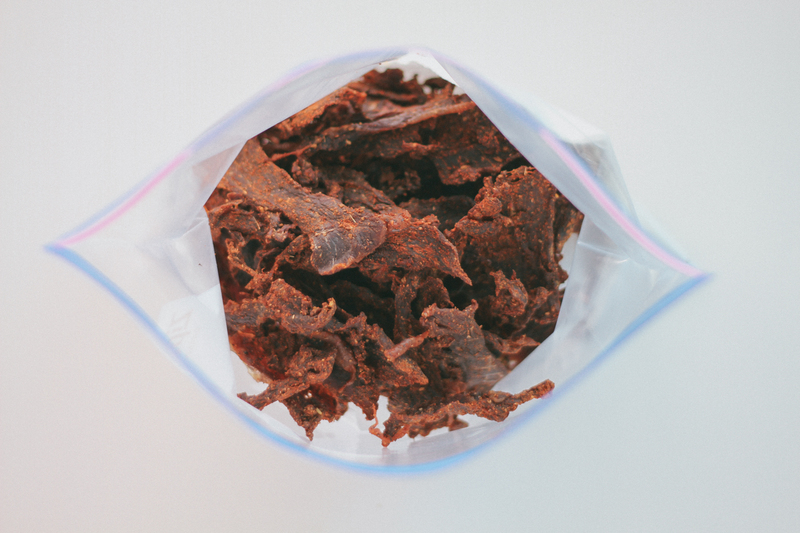 I really love crunchy things and salty things and this jerky recipe really hits that sweet spot for me. 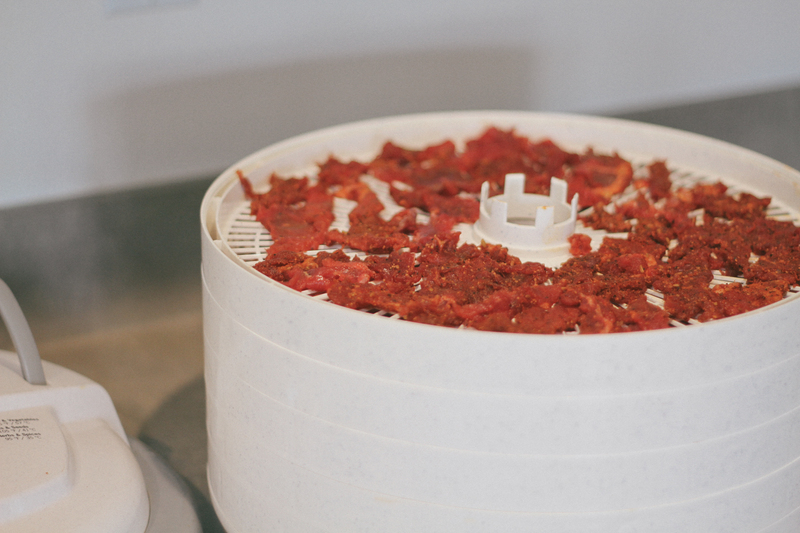 It’s super easy to make jerky at home if you have the proper tools and the patience. 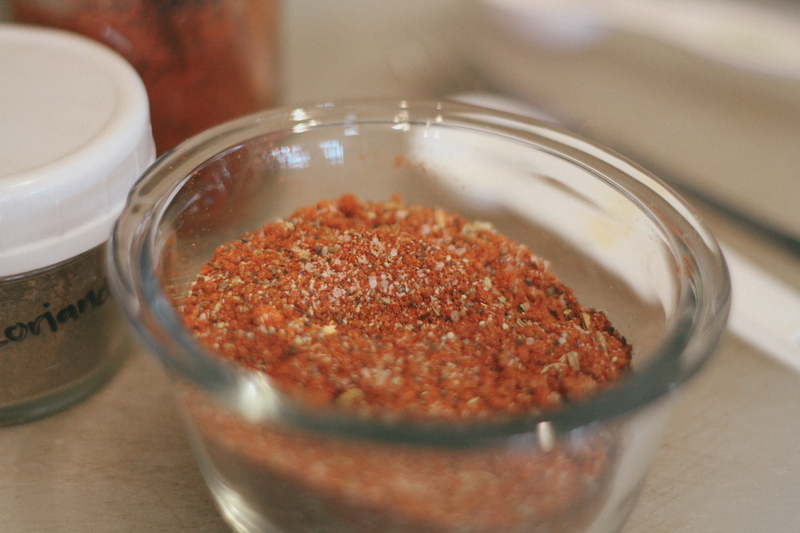 So for this recipe you’ll need a food processor and a dehydrator. 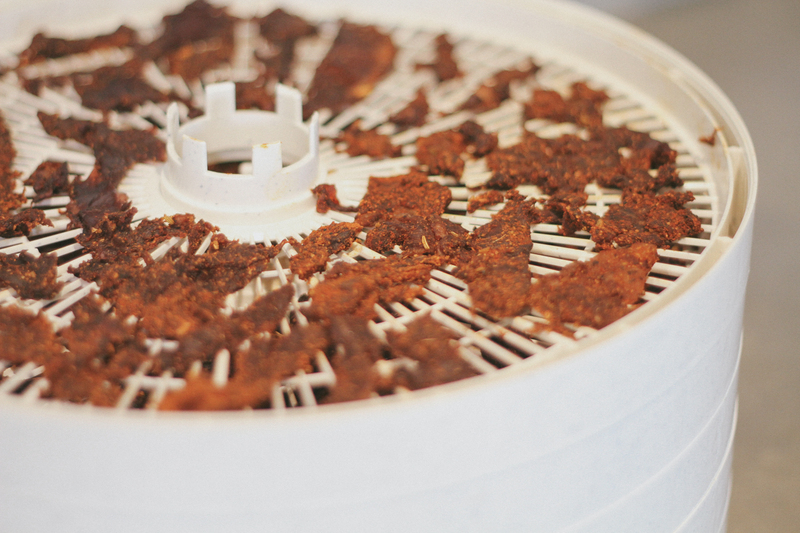 Making jerky at home is great because you really get to control the ingredients, the thickness and doneness. 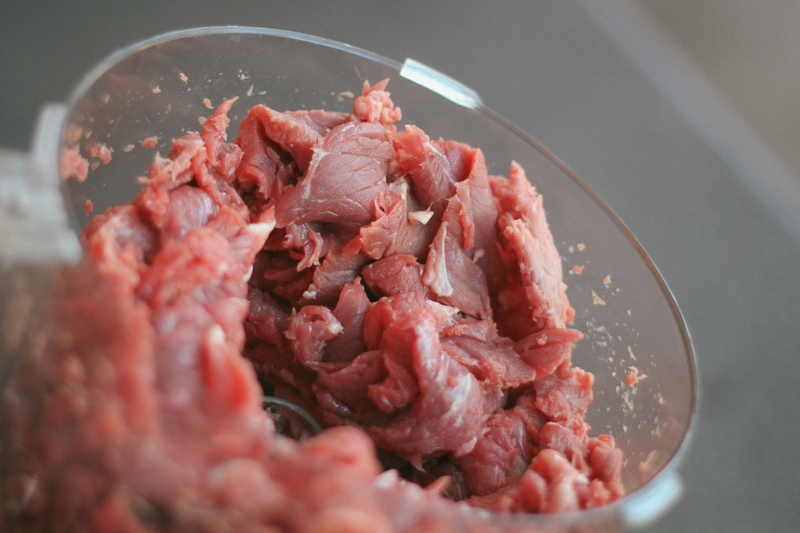 Another great thing is that you typically use a lean cut of beef for making jerky which means that it’s more ok to use non grass fed meat (in my not so scientific opinion) because all the bad stuff found in corn fed beef (higher omega 6) is typically found in the fat. That’s why paleo normally says to eat high quality grass fed meat is so that you get all those great benefits (higher omega 3) found in the fat of grass fed meat. 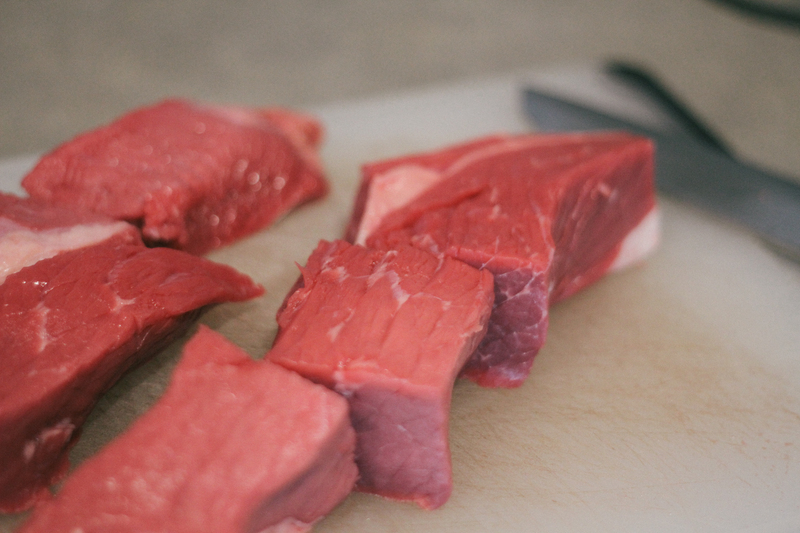 But if you’re making jerky with grass fed London broil you really won’t be getting too much of the great benefits about grass fed meat, because that’s normally found in the fat. Does that make sense? 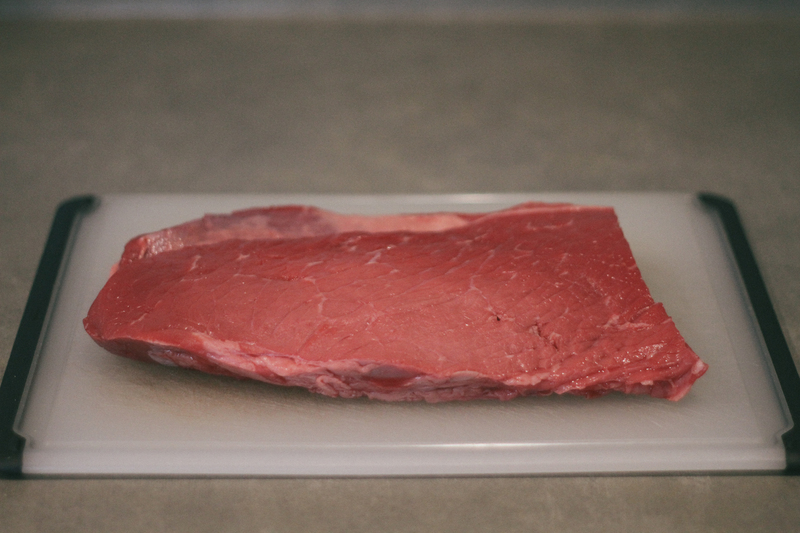 If tl;dr then know it’s ok to use regular London broil in this recipe, not grass fed. 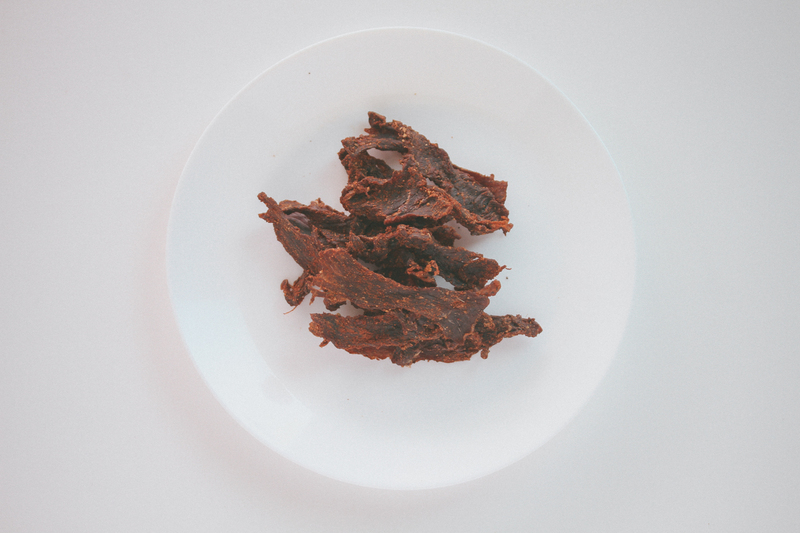 There are so many great jerky recipes out there but the spices used in this recipe are inspired from here because I really don’t like my jerky to be soy sauce based and I love the techniques Russ uses here. Once it’s done to your liking place in a ziplock with a paper towel. 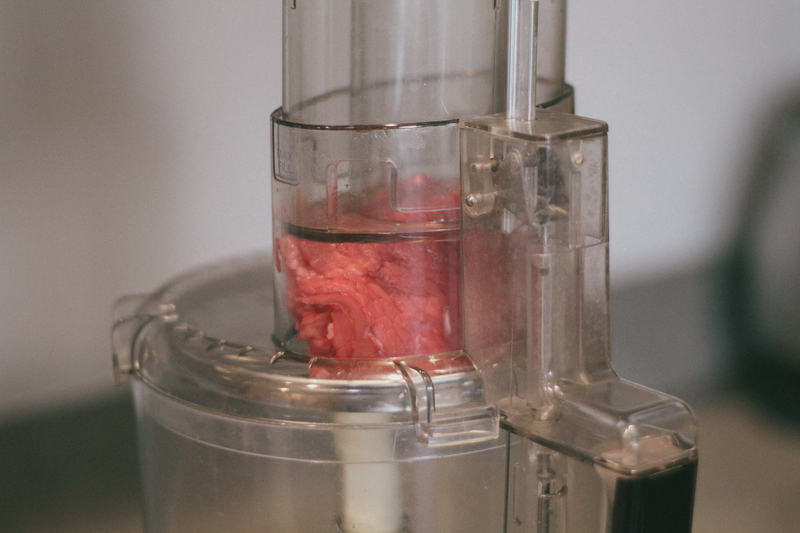 Do not close until the beef is fully cooled. Enjoy! 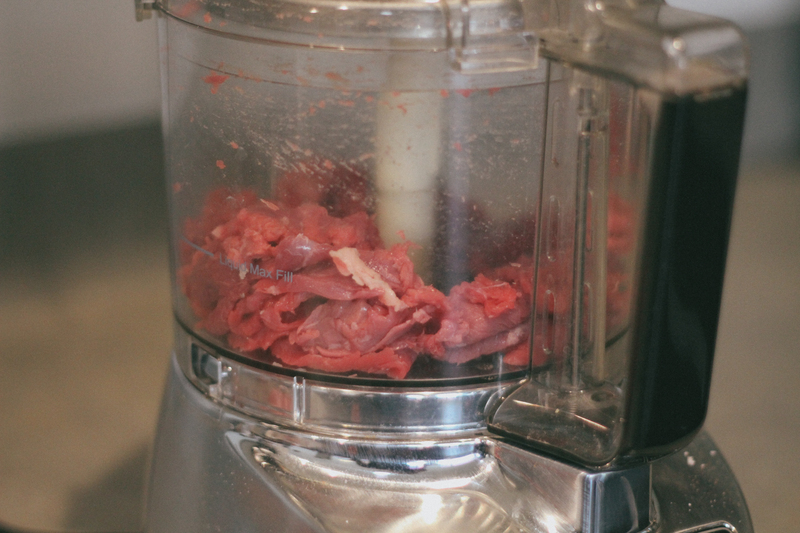 You can totally slice the London broil against the grain in thin strips, but the way I like to do it is from a tip I read here where he uses a food processor. Just cut thick chunks with the grain and let it go in the food processor so it chops against the grain with the mandolin blade. Process the whole 2lb in the food processor. 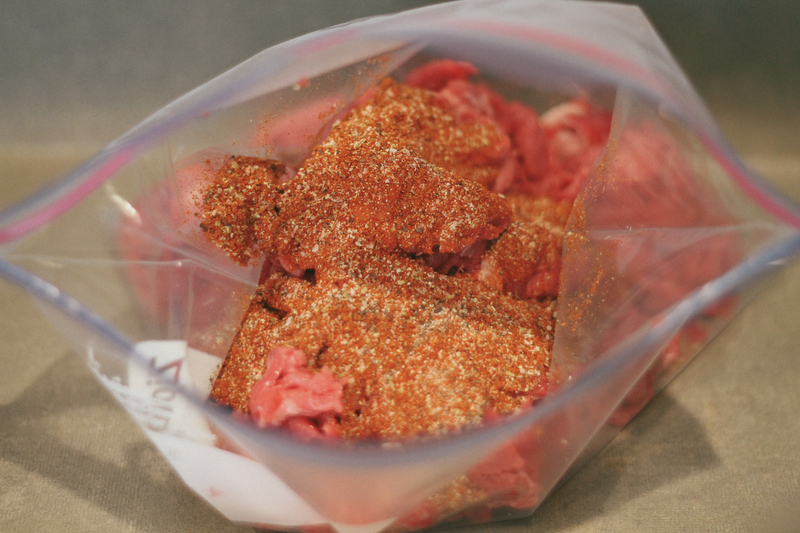 Remove the chopped up meat and put in a ziplock bag with all the ingredients and let it marinate overnight. This is a dry cure so it may release some liquid in the bag the next day. Then when you’re ready to put in the dehydrator the next day, place all the meat pieces on the trays of your dehydrator evenly spaced out. Know that the processor probably chopped some pieces weird, don’t worry just mush them with the other pieces and as they dehydrate they will fuse with the other pieces. Rotate trays every 2 hours from top to bottom. After about 5 or 6 hours it should be done. I consider mine done when it has a little crunch to it but with some squish to some of the thicker pieces still. It’s up to you so play around with it until you get it to your liking. 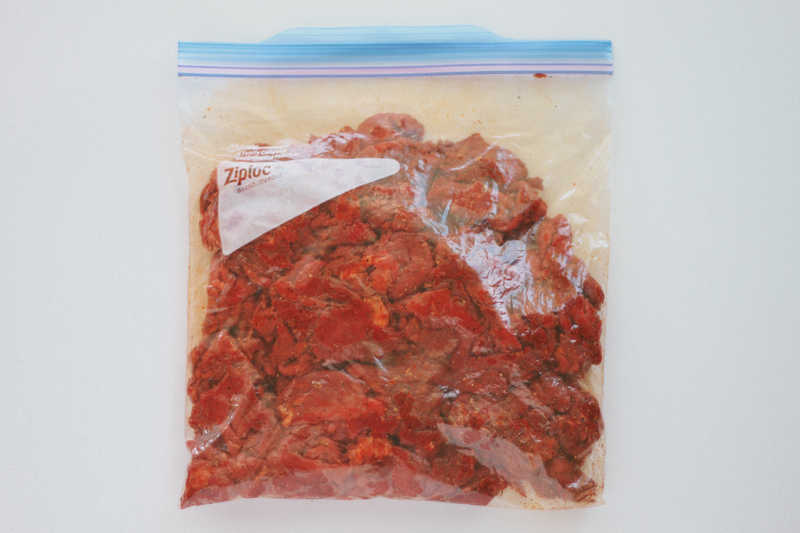 Place it all in a ziplock bag with a paper towel. 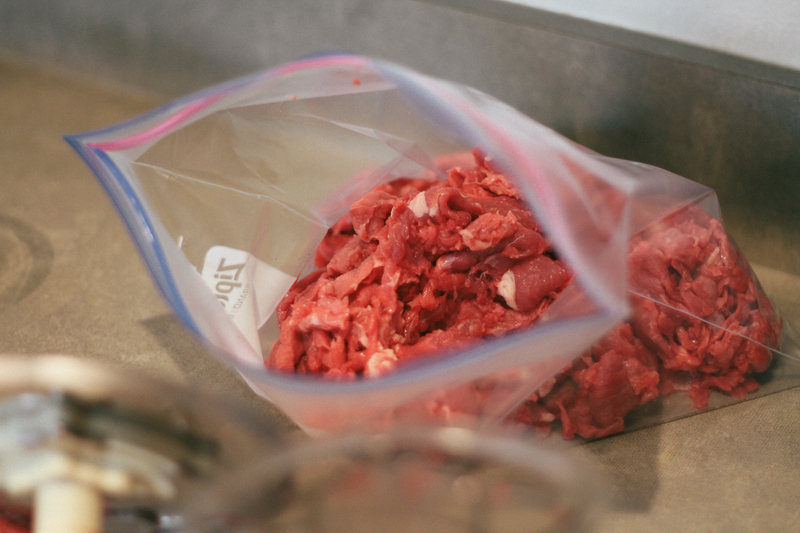 Don’t close the bag for a few hours until it fully cools. This should stay good for a couple weeks but we eat it all up in a few days pretty quick. 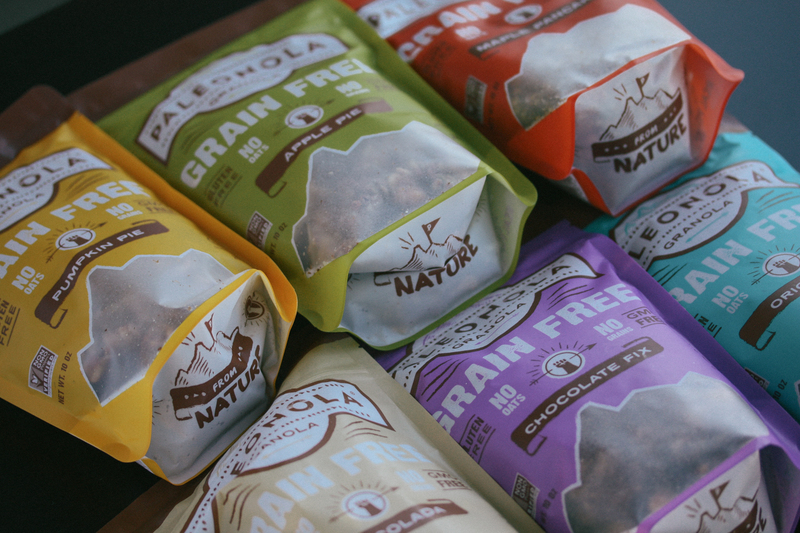 When I first went Primal, I was always on the lookout for Primal snacks. It was tough shifting from burning carbs for energy to burning fat for energy at first. I would get super hungry between lunch and dinner on the way home from work. So I searched online for what would be a good Primal snack. 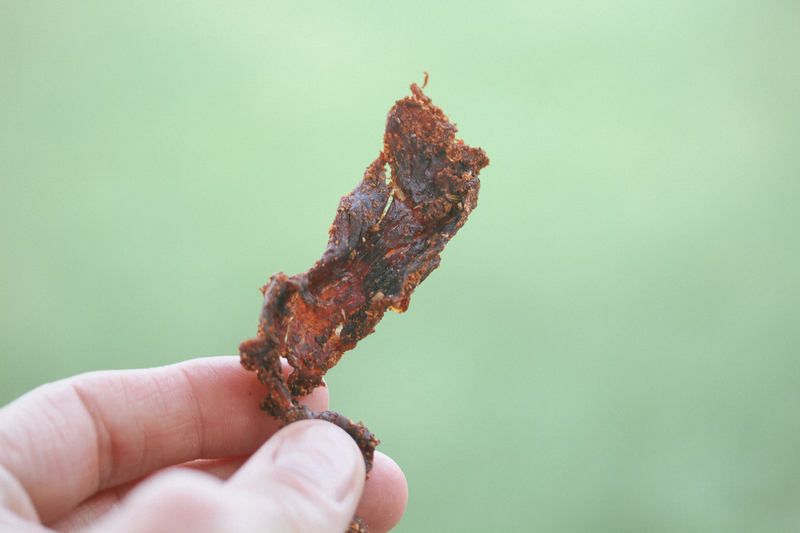 As it turns out, jerky and nuts are a great source of protein and fat to hold you over until dinner. During that time I came across something called Pemmican. I so badly wanted to try making some but I was just too lazy. Then I came across Epic. 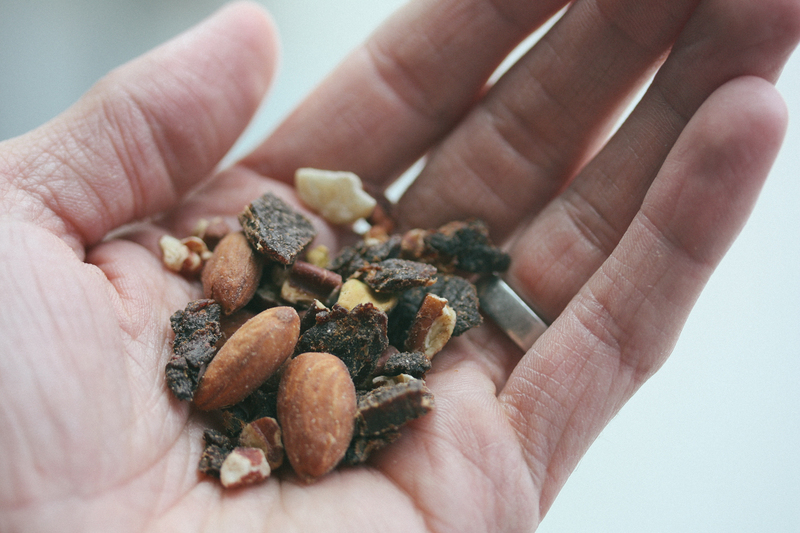 They were basically a modern take on Pemmican, they had meat, berries and fat in the form of nuts. I had to order some. I ordered a box of the Turkey Almond Cranberry bars and they were the perfect snack for in between meals, or hikes or camping. Perfectly Primal. Then not too long after that I noticed that Epic started branching out to jerky and trail mix packs. First of all, I was super interested to check out these new jerky and nut packs because they just looked so cool. Once again, being that I’m a designer by trade, I got enticed with all this amazing branding and package design. So I reached out to Epic to see if I could review some of their newer products since I was already familiar with their Pemmican-esque bars that you can check out here. Epic was kind enough to send me some of their Bites and one of their Hunt & Harvest packs. So as with any review I wanted to check out the three main categories: Nutritional Profile, Affordability and Taste. Epic has a bunch of different products and they just keep expanding. 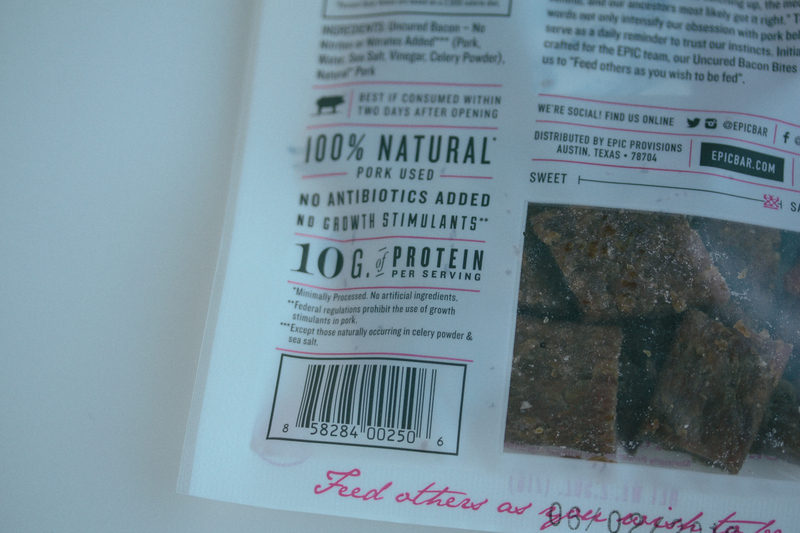 So Like I said I started with their bars, then they created some bites and bits, trail mix packs – and now they’re branching out to selling pastured cooking fats and bone broth. What we’re looking at today is their Bites and their Hunt & Harvest packs. What? Zero Carbs? Whats not to love about the nutritional profile of these. The way they get away with that is because there is no sugar used for curing or added sugar after the jerky is made. 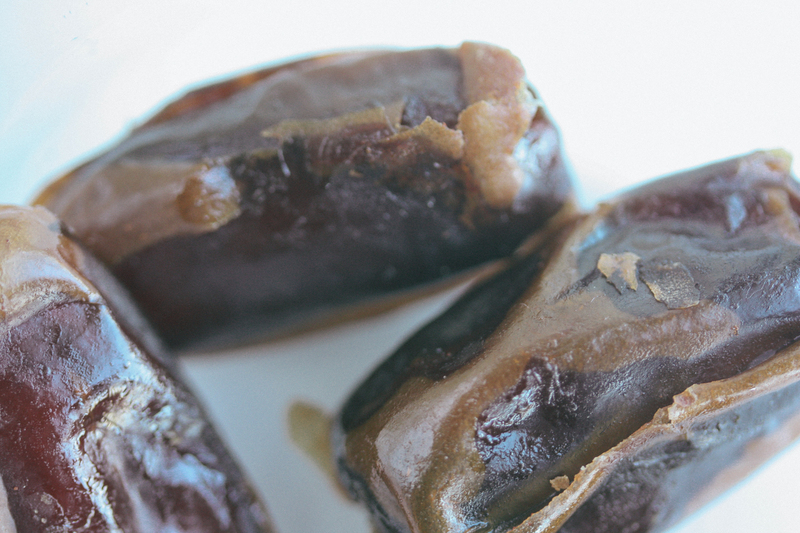 If you’re looking for a perfectly Primal snack, you can’t go wrong with these. Packing some fat and protein and zero carbs. You’re on your way to becoming a fat burning beast. 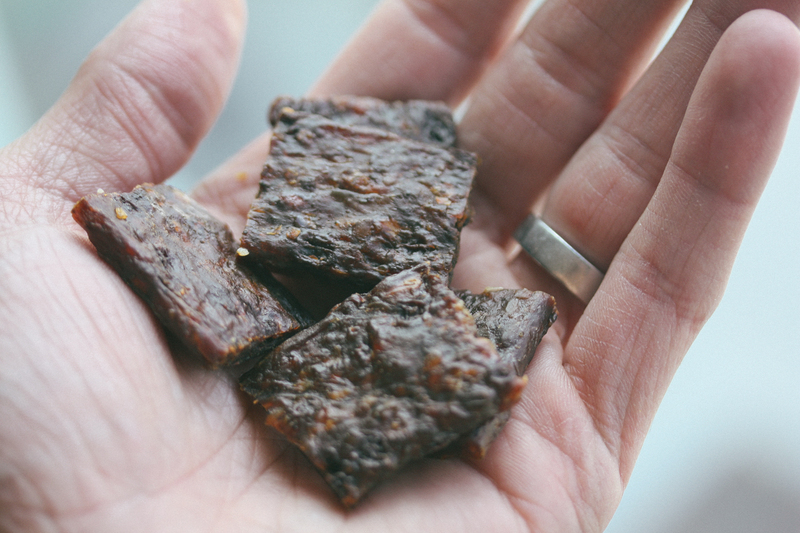 This chicken jerky comes in with a little more carbs and less fat, but it’s still a low sugar snack and perfectly Primal. Ingredients: Jerky (grass fed organic beef, wildflower honey, water, salt, organic apple cider vinegar, yeast extract, organic black pepper, celery powder, organic garlic powder). 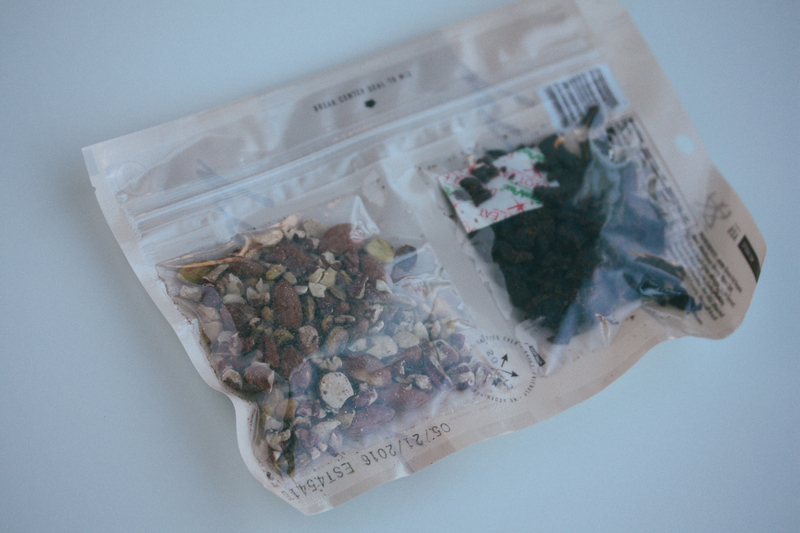 Nut Mix (roasted almonds, roasted pecans, roasted Brazil nuts, pistachios). This is such a great little package. 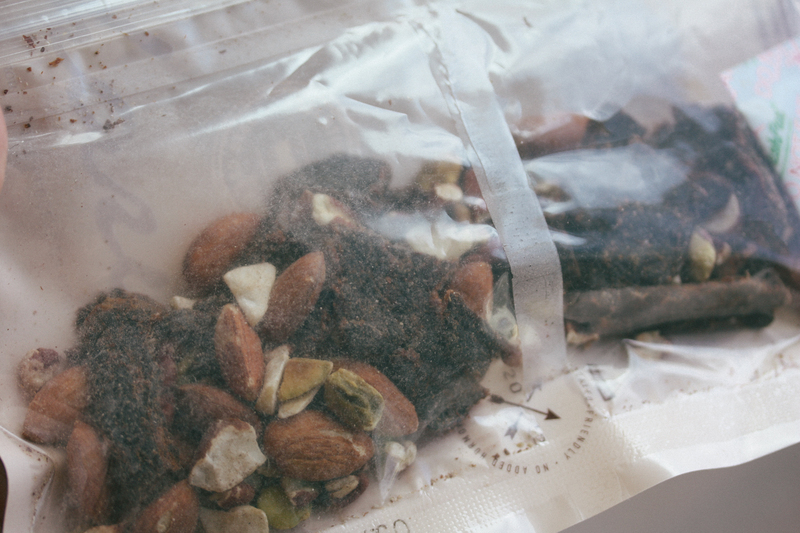 Packing just the right amount of fat and protein for a snack or on the go meal. 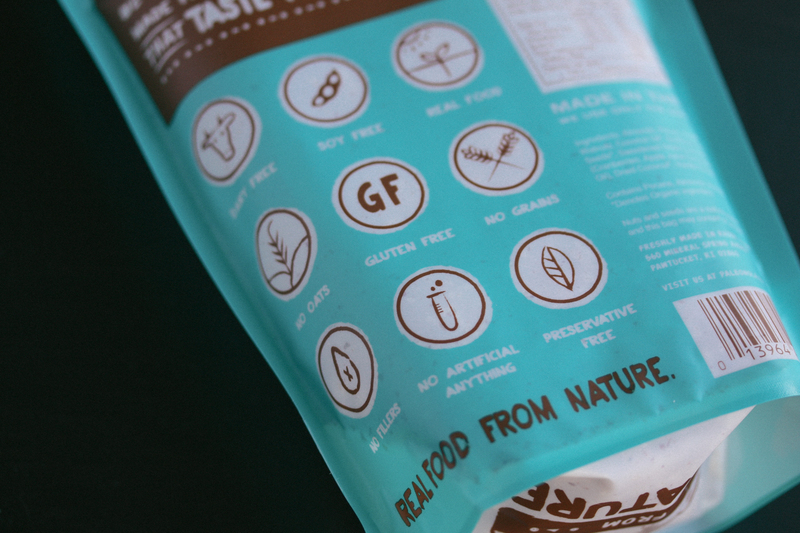 Low sugar and real whole ingredients with grass fed beef. All of these products have an impressive nutritional profile. 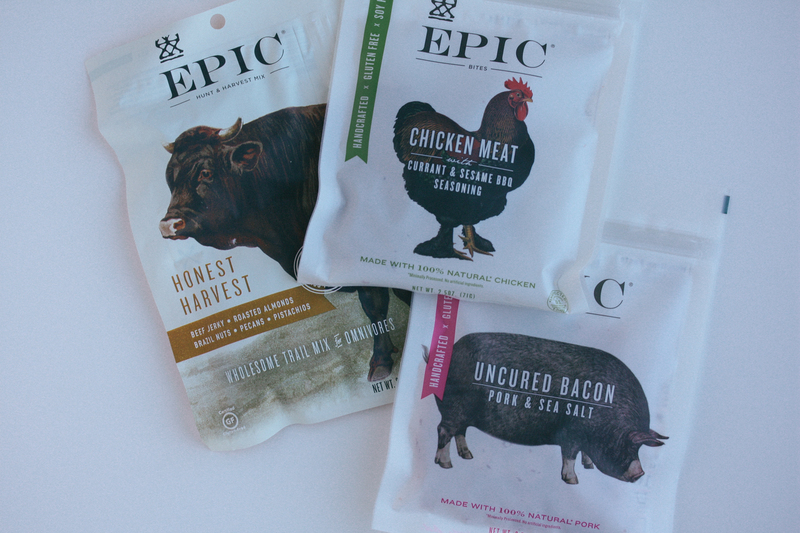 Epic really focuses on high quality ingredients, pastured raised meats leading to high omega–3 & CLA, gluten free, soy free and low glycemic, paleo friendly snacks. So it’s without a doubt that not just these but any of Epic’s products have an amazing nutritional profile. With their products you don’t have to worry about high fructose corn syrup or other weird ingredients that you don’t know how to pronounce. It’s all real ingredients, not something some scientist invented in a lab. Now I put the price of a sorta comparable Oberto Bacon Jerky up there to compare and see that yea Epic is slightly more expensive for a comparable product and size (2.5 oz bag) but the difference is in the ingredients. Oberto’s Bacon Jerky is cured pork with sugar, unlike Epic’s which is uncured. So if uncured pork is a big thing for you, I would say Epic is the way to go if you’re willing to pay the extra money, otherwise Oberto isn’t necessarily a bad option if you’re not concerned with the quality of your protein, as I assume Oberto’s pork is CAFO. Finding a comparable product for the Hunt & Harvest pack is kinda difficult as there really isn’t any other product out there marketed like this. Sure you could go buy some grass fed jerky yourself and some nuts and come in less expensive, but you’re paying for convenience with this pack. It’s about having a nice little snack for when a craving hits or when you’re on the go – hiking, camping, running from meeting to meeting. For the price I think it’s a great deal to have for when that craving hits. Soft. Salty. Pork. Expect nothing else and expect nothing more. If you like salty you’ll love this. I really liked these bacon bites. Not tough at all and not sweet at all which is what I like. Pretty great. 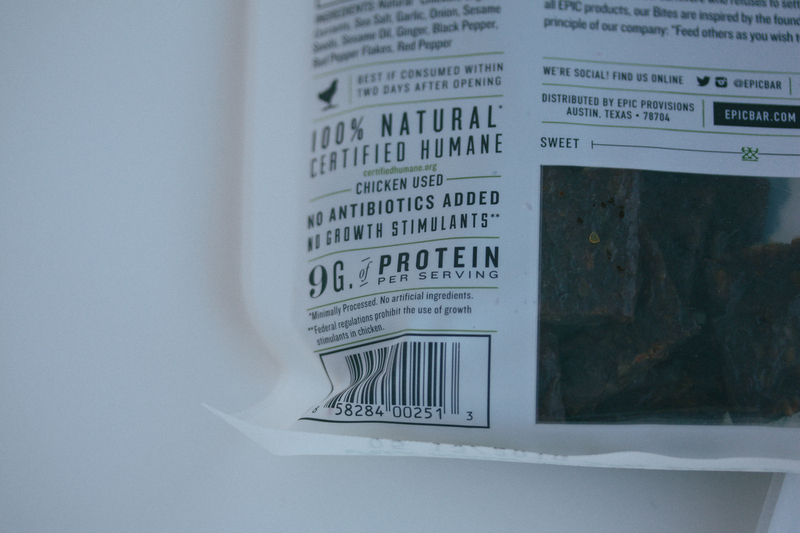 I normally am not a fan of chicken jerky but I really liked this one. It was just the right amount of sweet from the currants and has a pleasant sesame taste to the jerky. Both of these jerkys aren’t just straight dehydrated muscle meat. They’re sorta ground up and turned into strips and cut up. Sounds gross but it actually works for both of these jerkys. Now this is a cool little idea. There are two sides to this pack that have jerky on one side and mixed nuts on the other side. 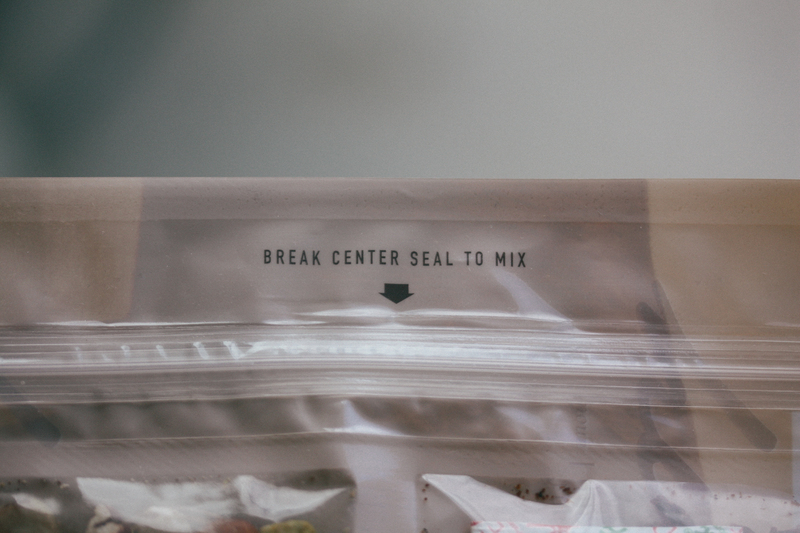 When you open the ziplock you open the divider as well and mix it all together. The jerky is traditional grass fed muscle meat dehydrated and the nuts are simply mixed dry roasted nuts. Both of these together had a great trail mix salty taste. 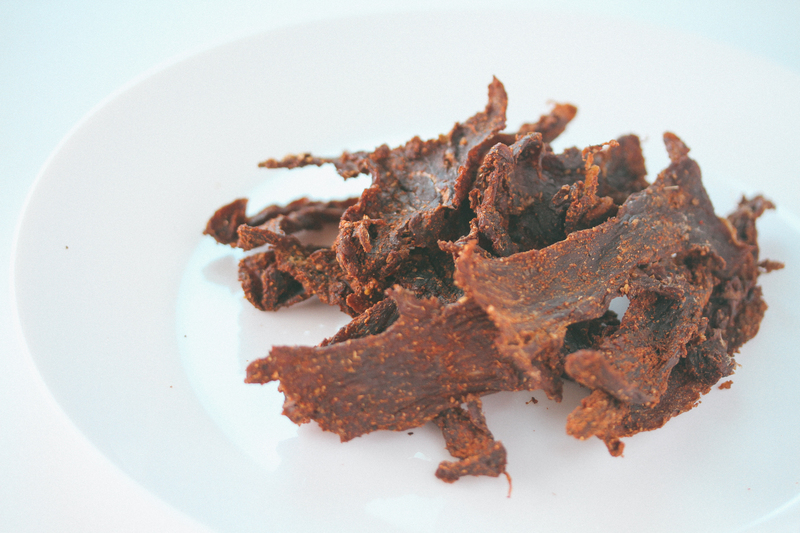 The jerky is much tougher than the other stuff but the flavor is nice and salty and peppery. Not sweet at all. I really like the idea of this pack and suggest having a few on hand just for emergency hikes or if you’re strapped for time and need some quick protein and fat. Epic is onto some great things. 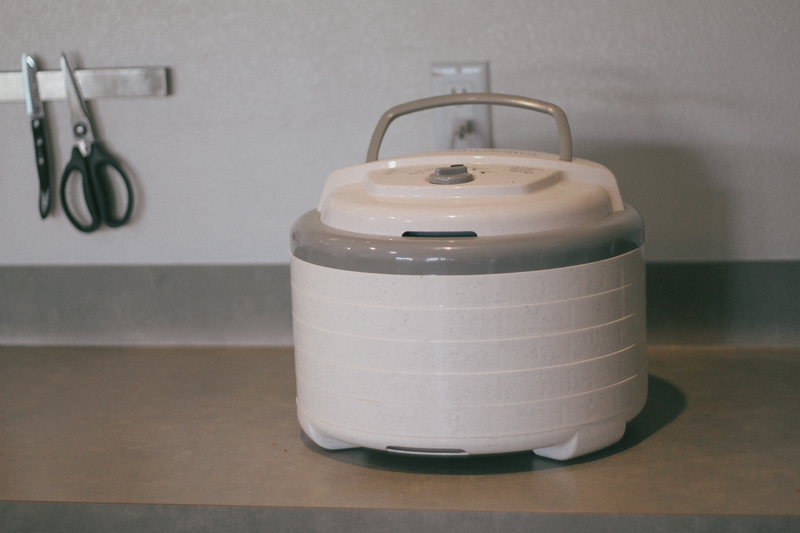 They’re a promising company with some pretty amazing products and I look forward to trying out all their new stuff like their cooking fats and bone broth. 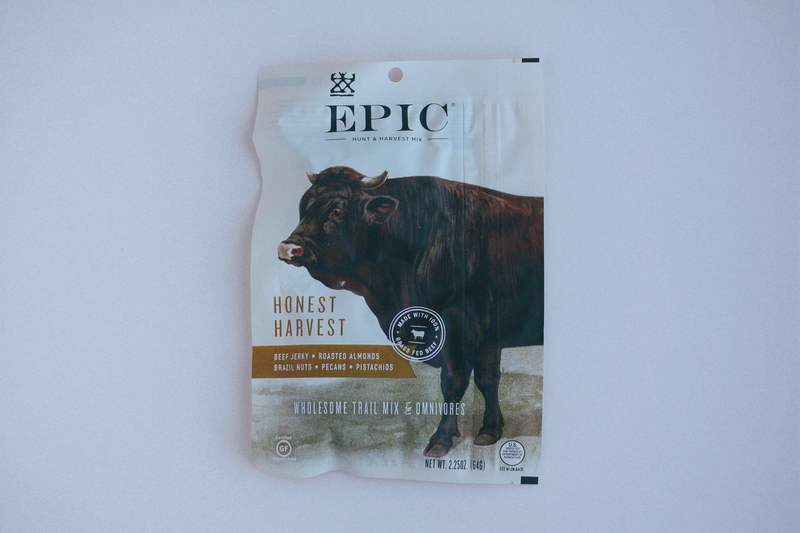 I’m glad there are companies like Epic out there dedicated to making whole food snacks, with fat and high quality protein. Feel free to share in the comments what your favorite Epic products are. Thanks for reading. I first caught a glimpse of coconut butter in this video where Mark says he eats some for an afternoon snack. So I headed over to Nikki’s and bought a jar and once it arrived I’m pretty sure I consumed it all in just a couple of days. 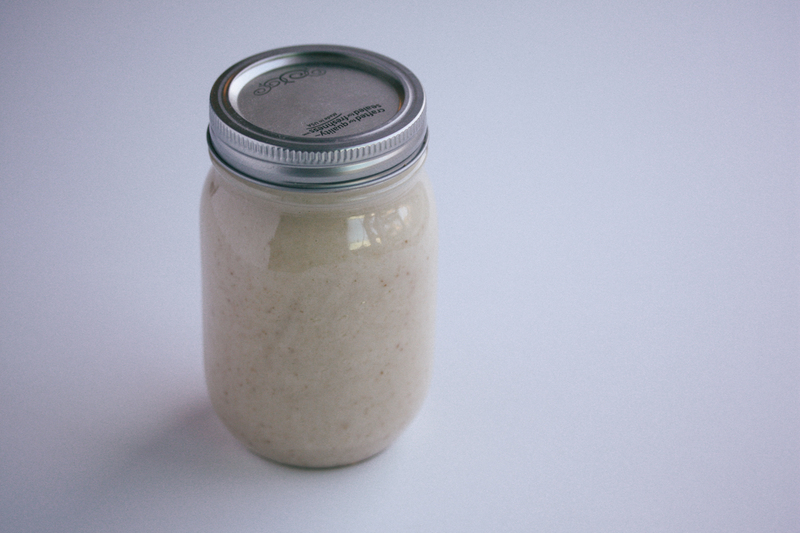 I would just keep buying it by the jar but I wanted to take a stab at making it myself. After some googling I found this recipe for how to make some yourself. I pretty much followed this recipe with a few tweaks. One thing I love about this snack is it sustains you. A couple spoonfuls by itself can satisfy an afternoon craving, or you can eat it with some fruit or apples like I do after dinner. One time in particular that I find this a great snack to have on hand is when I go to the river with my family. Going to the river normally includes lots of wake boarding, paddle boarding and more activity than I normally get at my (standing) desk job. So after breakfast and a nice wake boarding run this butter really comes in handy to provide energy and give a huge dose of fat. If you’re body has been trained to use fat for fuel this will work great. If you’re still stuck being a sugar burner, this might just be extra calories that you’re body doesn’t know how to use efficiently. For more info on becoming a fat burning beast check out this post. 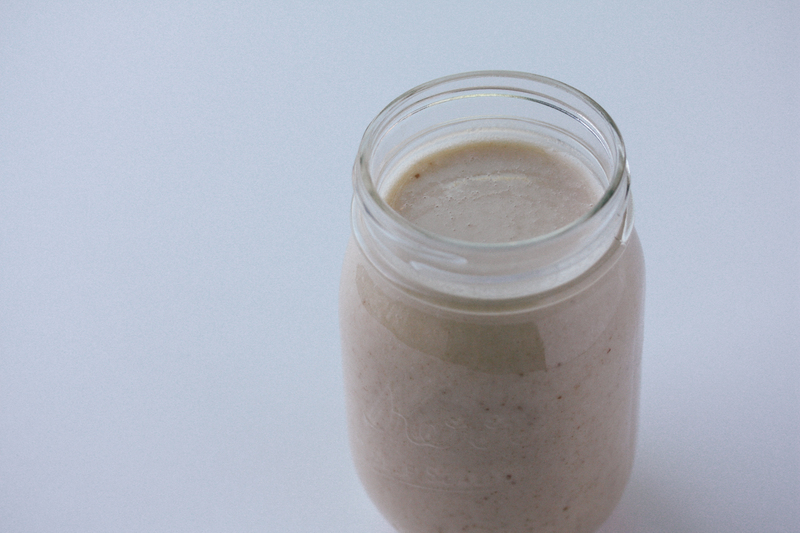 Once it’s blended to your liking, transfer it to a mason jar and enjoy by the spoonful! 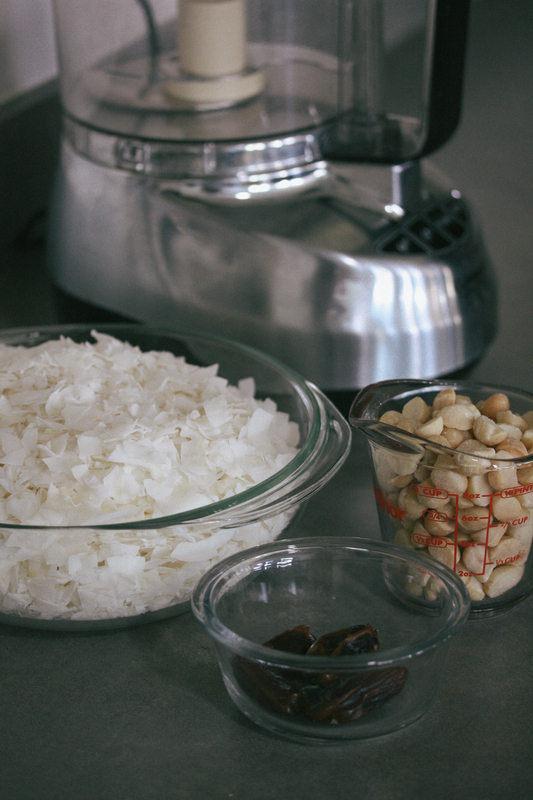 In a food processor, like this one I use, blend nuts and 1 cup of coconut and dates first until it’s all blended roughly, about 30 seconds. 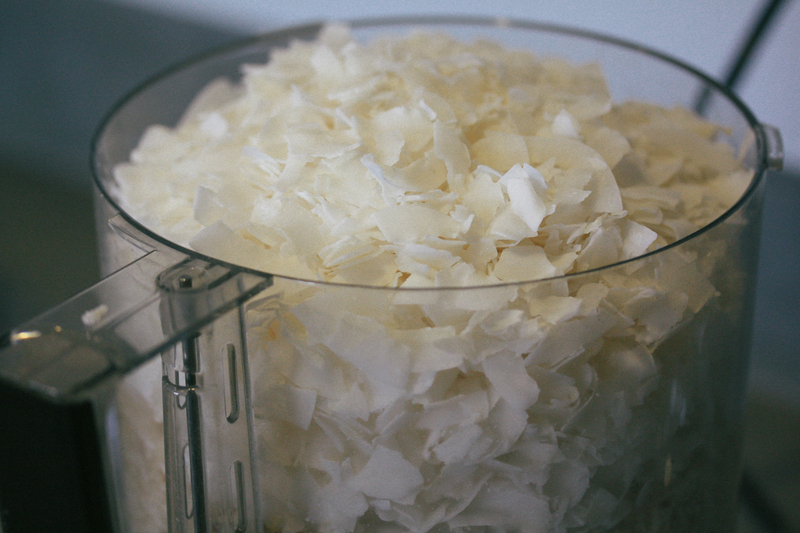 Now the easy part, dump the rest of the coconut inside the food processor. 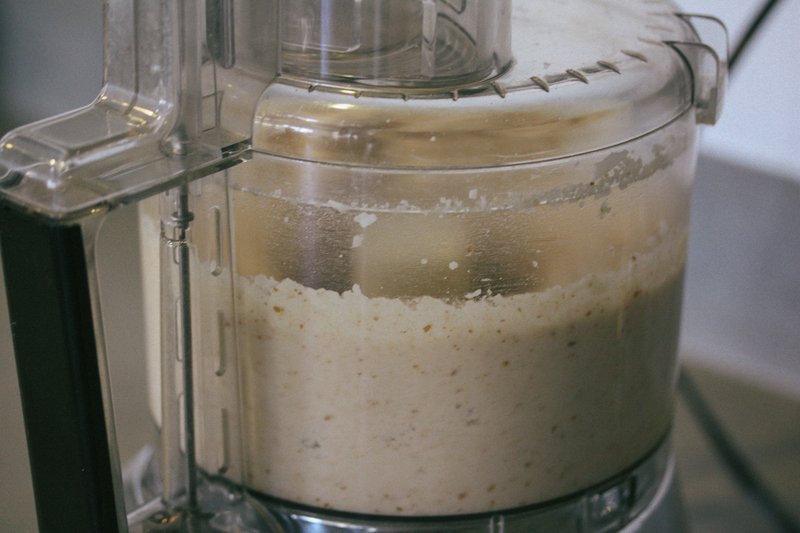 It should fill the food processor all the way to the top. Disregard the line that says don’t fill past this line. We’re gonna break the rules. 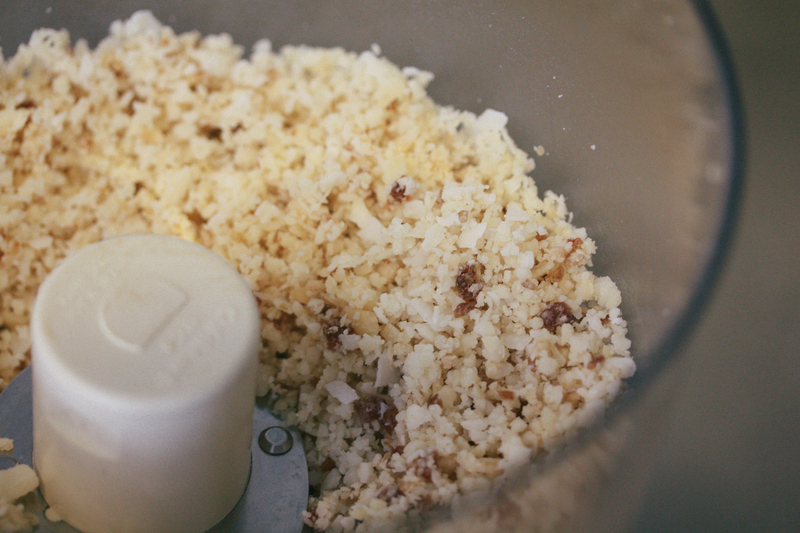 Now turn the food processor to on and leave it on until the butter is a nice creamy texture to your liking. This takes about 15–20 minutes for me and my climate. I’ve noticed that the ambient temperature in my house or time of year effects how quickly the coconut turns into butter. Just watch it and taste it and stop when you’re satisfied. 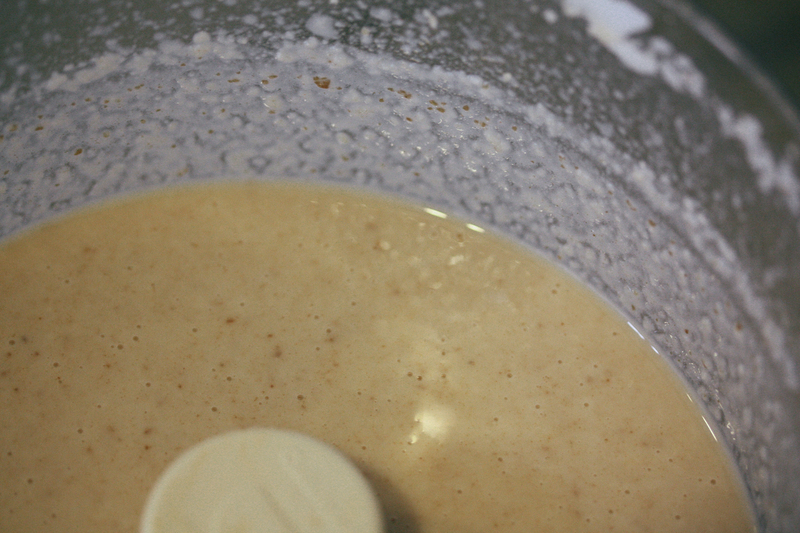 Once it’s all blended into butter, transfer it to a jar or some other container. It should probably be good for a week or so but I guarantee you’ll eat it all before it goes bad. Enjoy! See, normally when I go grocery shopping I stick to the perimeter of the store. You know, where the real food is. I grab my eggs, meat, yogurt and vegetables. I may pop into the international aisle if I ran out of my prescription subscription coconut milk from Amazon. But I have this problem where I get my cart full and then I end up creeping down the granola aisle. I love yogurt, full fat greek yogurt. Plain or the honey kind. And it’s just so boring by itself. So I convince myself to pop down the aisle with the granola on it. I scan the boxes of granola and check out the ingredients looking for some sort of grain free granola to top off my yogurt. I get really close to buying some flax seed gluten free organic something or another but then my brain stops me and says do you really want allll those carbs from the oats and sugar (not to mention the death canola oil). Thus far I have been able to put down the box and head to the checkout. Nevertheless I still have this desire to top off my yogurt with something crunchy! Now I tell myself I can always throw some nuts, coconut oil and maple syrup on a tray and make my own. But that never happens. Nobody’s got time for that. So as I was on Instagram browsing through millions of photos of really good looking food. I came across Paleonola. The name really says it all – I didn’t need to look them up to first understand what they were all about. They were obviously about making Paleo-nola. Duh! So I got in touch with them and asked if I could review their grain free granola, and literally a couple days later I have all six flavors sitting at my doorstep. 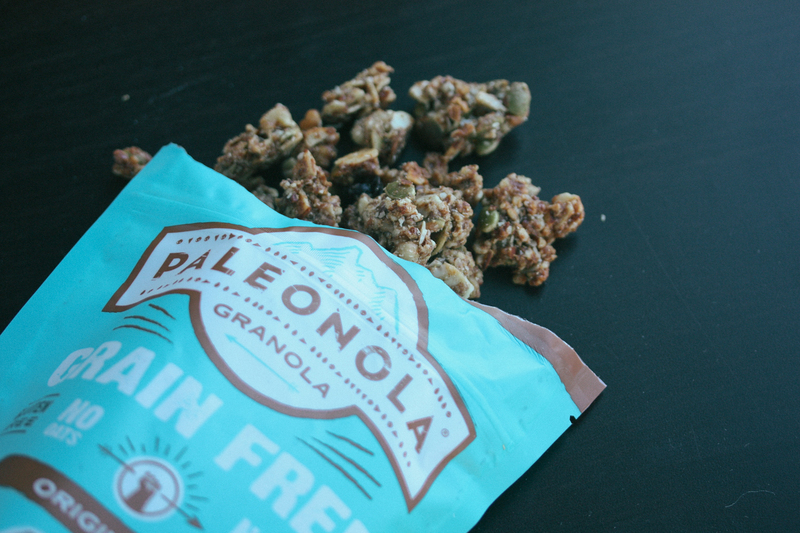 When I opened the box, it was like a light was shining down from heaven revealing the first grain free granola I could get my hands on. Here it is. 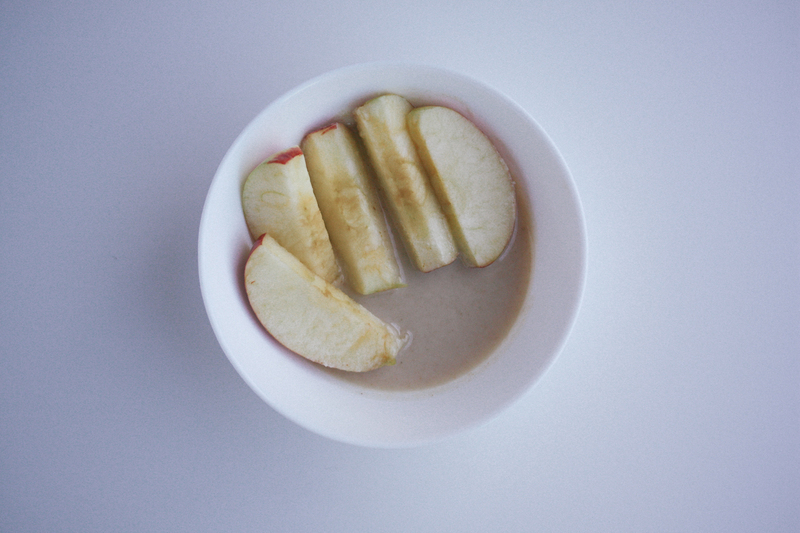 At last – no oats and all. Lovely. So based on their mission statement above, have they accomplished that goal? Let’s take a look at our three factors: Nutritional Profile, Affordability and Taste! Ingredients: Certified Gluten Free Oats, Wildflower Honey, Canola Oil, Raisins, Banana Chips (Banana, Coconut Oil, Sugar, Natural Flavor), Walnuts, Cashews, Almonds, Pistacho Nuts. Ingredients: Rolled oats, evaporated cane juice, soy oil, brown rice flour, flax seeds, hemp seeds, oat syrup solids* (oat syrup solids, tocopherols), sea salt, molasses. *Organic. Contains soy. 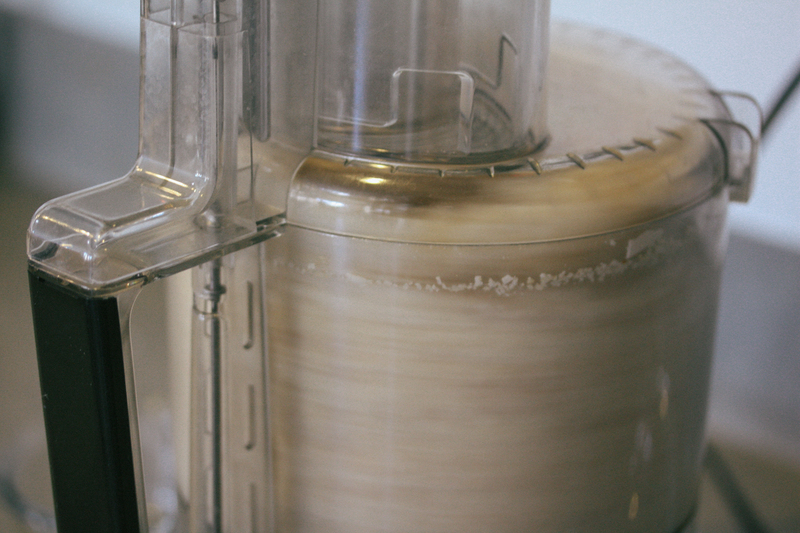 Produced in a facility that uses wheat, peanuts and tree nuts. Now this reminds me of my Cricket Flour Protein Bar Review in that Paleonola isn’t afraid of the fat – like the rest of the companies out there. 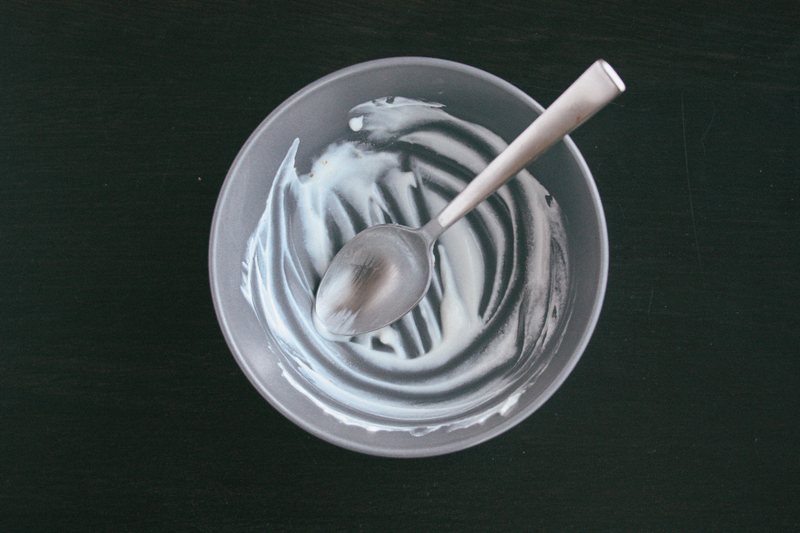 I want to be satiated when I eat a bowl of yogurt with granola or grab a handful for a quick bite – I don’t want a glucose spike and sugar crash. That’s where Paleonola kills the other two brands we’re looking at. 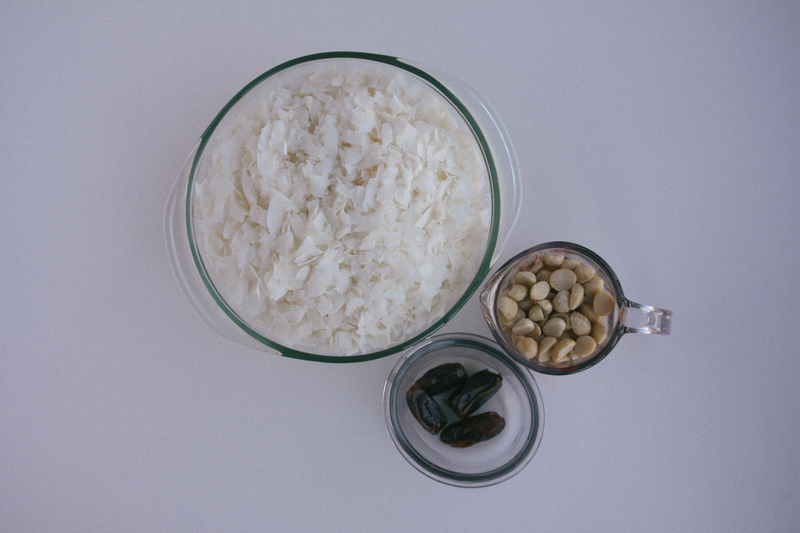 Enough fat from the nuts and coconut oil instead of just a bunch of oats and a couple seeds/nuts. Then when we look at the carbs, once again Paleonola beats the rest obviously since there are no oats. 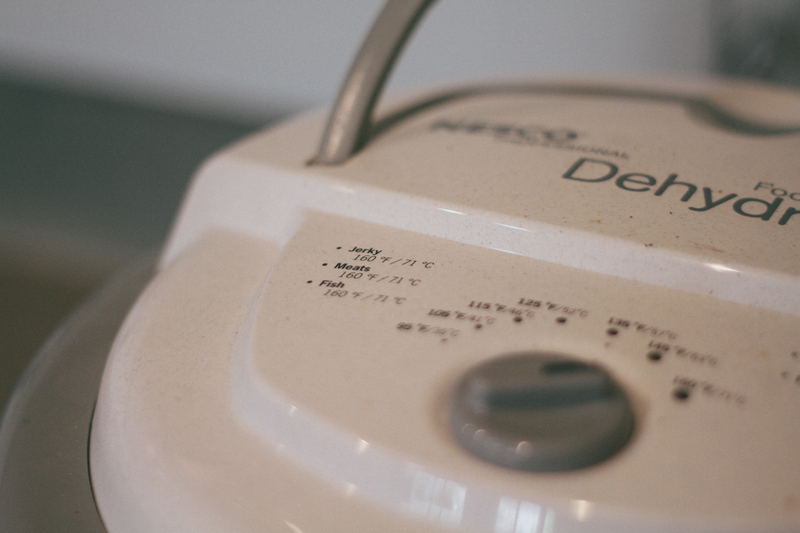 Oats are pretty heavy on carbs – and at the same time completely unnecessary nutritionally in my opinion. They’re just a cheap way to add more crap into the bag. It’s all about profit for those companies. 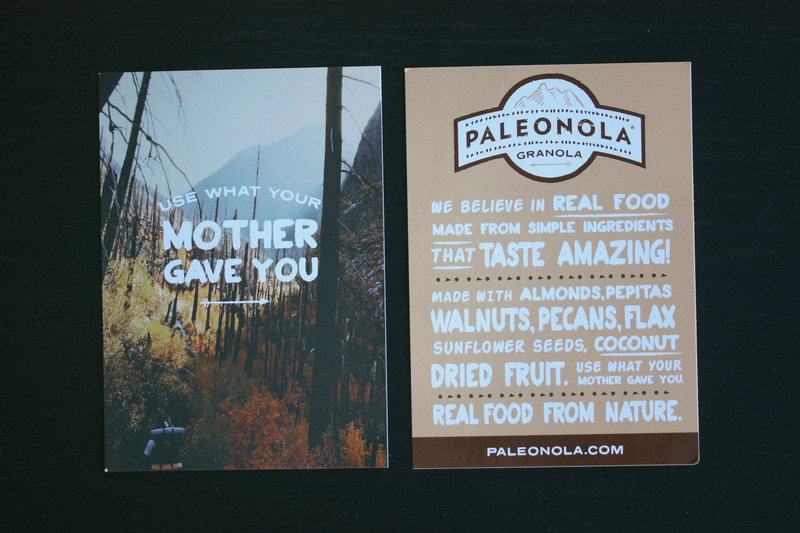 Paleonola seems to choose real food over profit. Protein is negligible since all that’s in these are nuts. But a handful of Paleonola and some slices of bacon would make a great meal for sure! This reality will most likely always ring true for Paleo products. You pay for quality. It’s why grass-fed beef is more expensive than conventional beef. It’s pretty obvious why the price is such a steady progression from cheap to expensive. Paleonola is the most expensive – yes – but that’s because real food is expensive. Udi’s comes in second, but only because they’re paying for the gluten free oats. It’s pretty costly to use gluten free oats in your product since oats are normally processed at the same facilities as wheat products. So for them to use gluten free oats means the oats are processed completely separate from any wheat/gluten products. For this very reason, Nature’s Path comes in at the cheapest. They’re not using gluten free oats, thus they can pump out a super carb inexpensive gluten contaminated granola. Sure it might not effect you unless you have Celiacs or something, but nevertheless that’s still the reason for the price differentiation. The reality is that if you want quality real food, you’re going to have to pay for it. I don’t mind paying for it since it’s the very reason why I would always put back down the granola in the store aisle – it was because I couldn’t justify spending money on sugar, canola oil and oats. I would rather spend my money on honey, coconut oil and nuts. Man this is some good stuff. 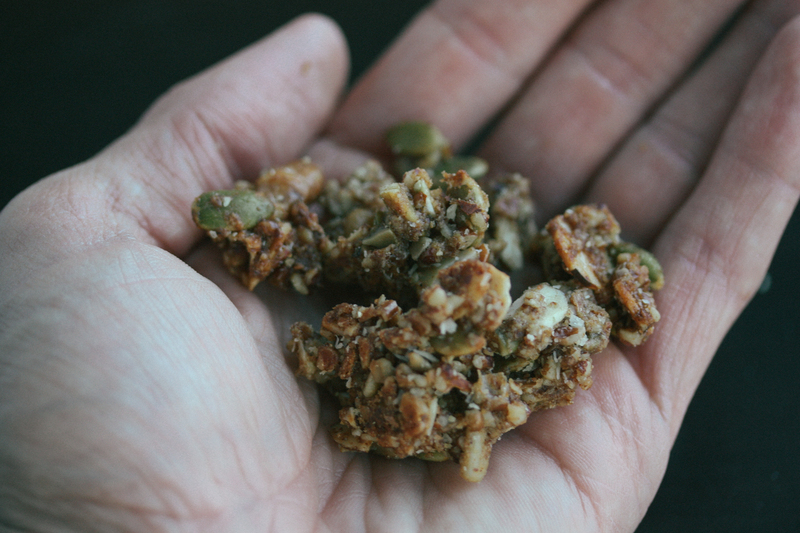 It hits all the flavors that granola should hit and then some. It has the sweetness and little hint of cinnamon. I also like that it’s not too crunchy. Some granola (from before I went Primal) almost felt like it would crack my teeth at times. Not this stuff. 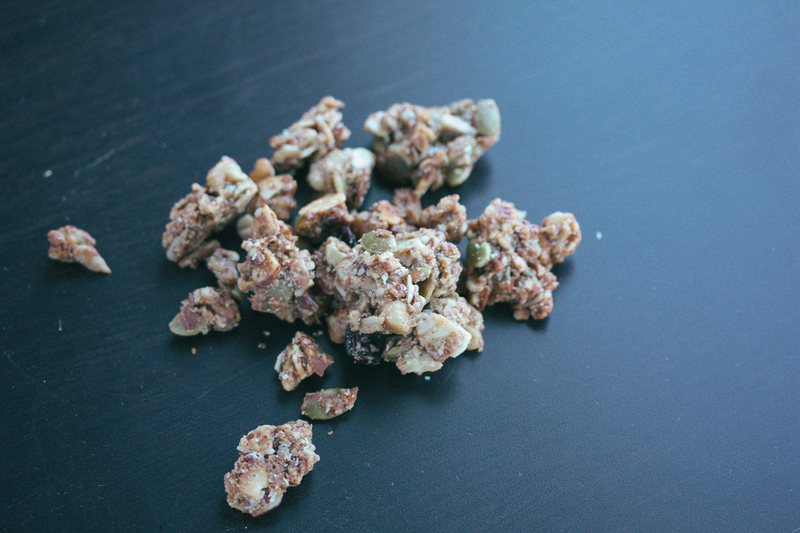 It’s nutty and crunchy but just the right amount of crunch. This one is definitely chocolatey and less cinnamon (obviously) than the Original. The chocolate used is cocoa powder, and you get the full taste at the end of the bite. 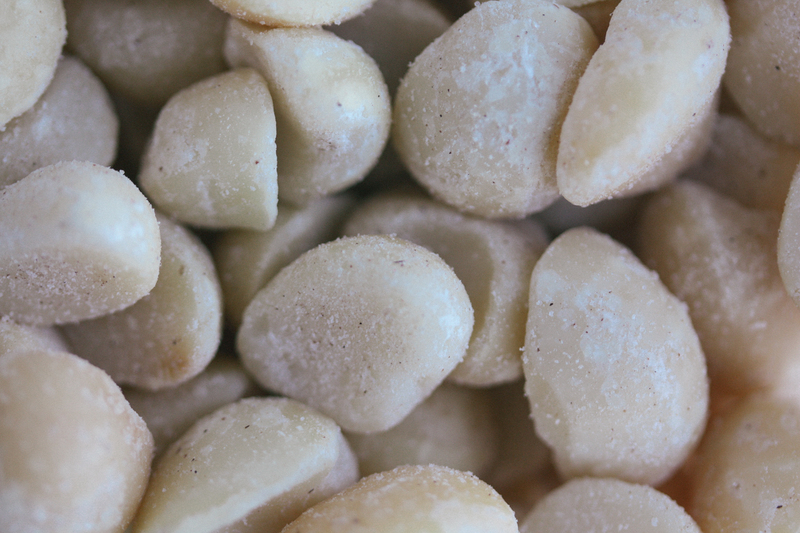 The addition of hazelnuts is great also, adds a different crunch. However, if you don’t like the bitterness of darker chocolate, this one might not be for you. The maple pancake definitely hits the sweet spot. 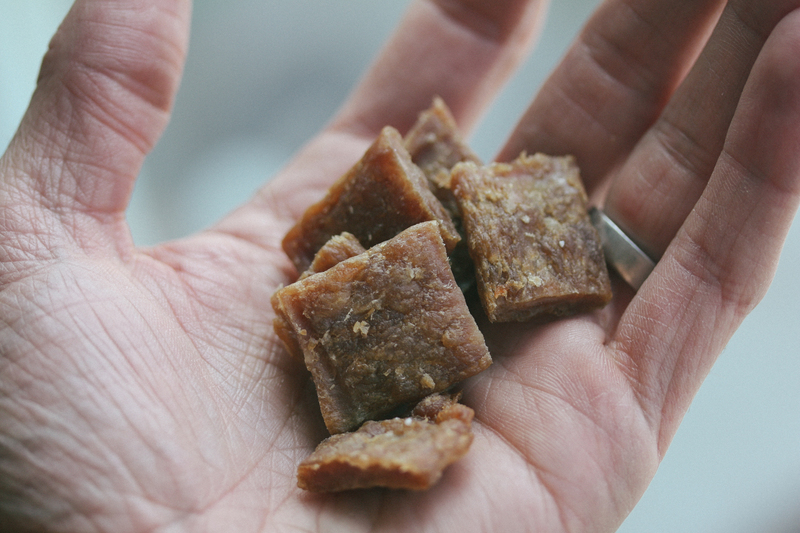 Noticeably sweeter than the original but only 1g more of sugar in the form of maple sugar. That’s where the maple pancake comes in – maple syrup. It’s a nice addition. There also seems to be a little more walnuts in this one that I tasted compared to the Original. So if you don’t like the distinct taste of walnuts, this one may not be for you. 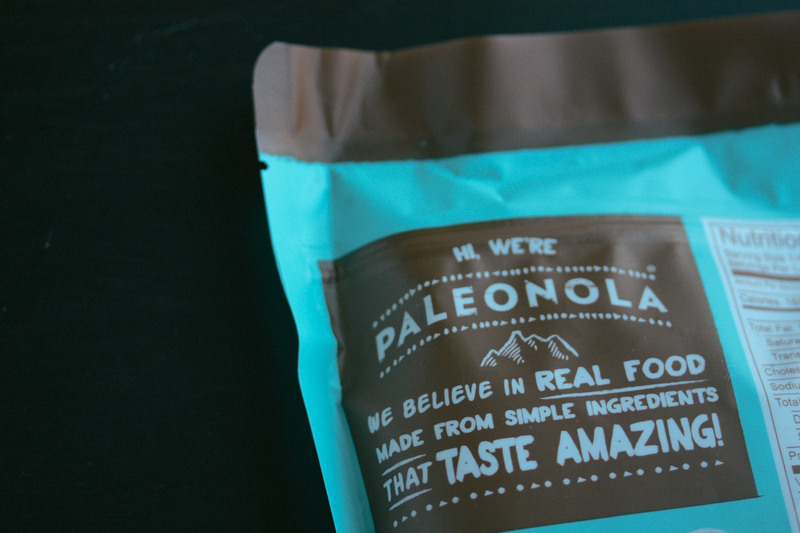 But if you’re looking for the sweetest tasting Paleonola, this one may be it. Woah. They hit the nail on the head with this one. Very distinctly pina colada tasting but with extra coconut. 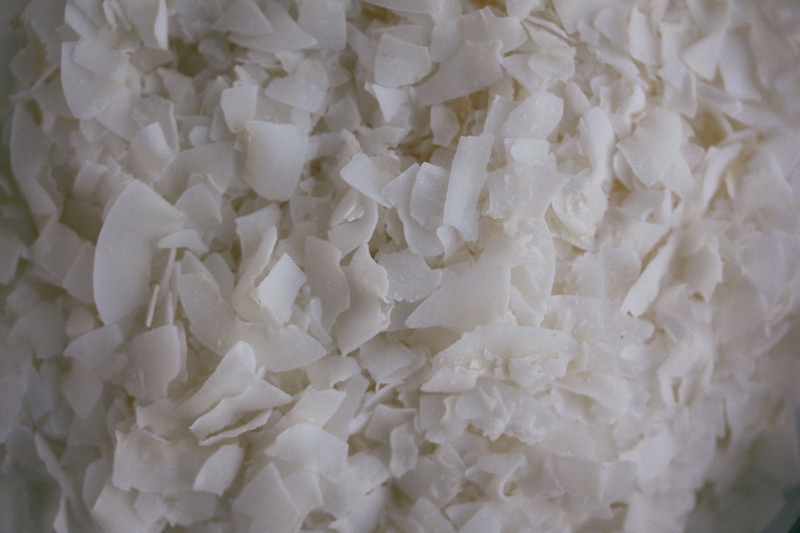 Imagine the taste of a pina colada and then imagine that you just ate a bunch of roasted coconut chips afterward. That’s kinda what you get with this Paleonola. I love it because I love the taste of coconut, but if you don’t like things that taste distinctly coconut, this one might not be for you. I have to say my favorite to eat just by itself is the Pina Colada flavor. 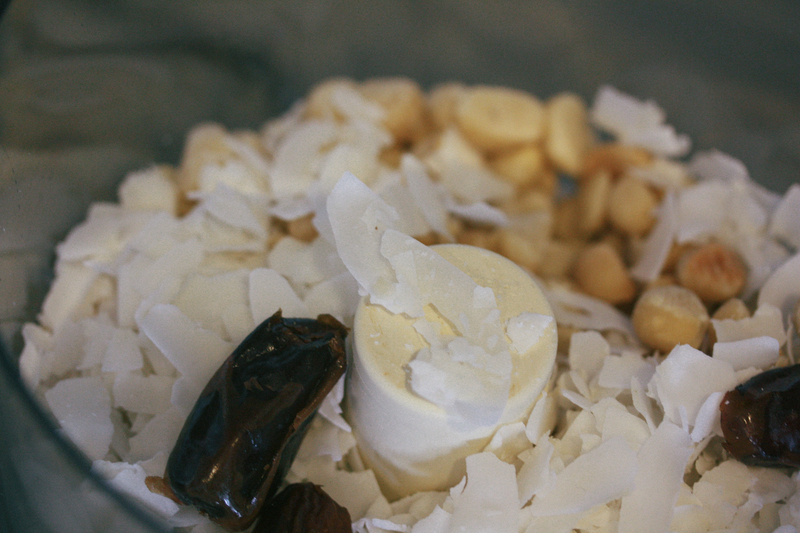 I think because I really like all the coconut chips that were used. Any of these flavors would actually be great on top of yogurt. Whatever flavor you feel like you can put it on top of your yogurt. If you’re in the mood for Fall tastes, throw on the Pumpkin Pie. If you’re in the mood for chocolately goodness, throw on the Chocolate Fix. 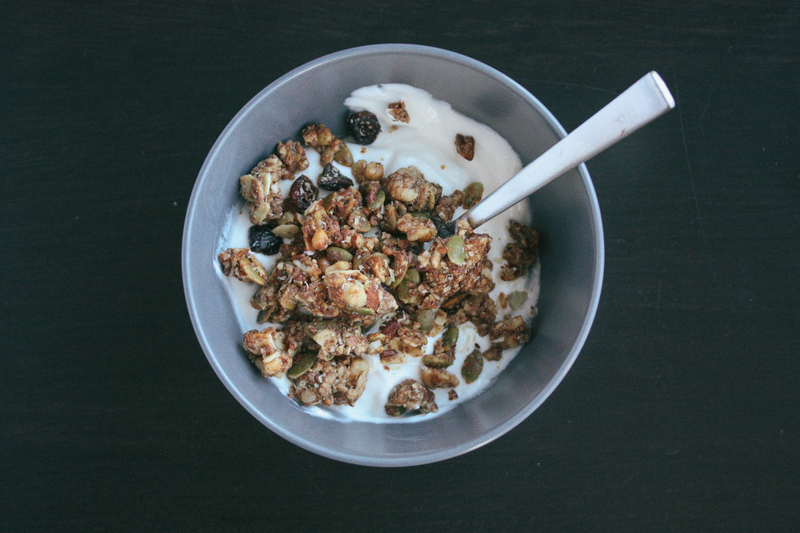 If you’re just in the mood for plain ol’ yogurt and granola, go with the original. 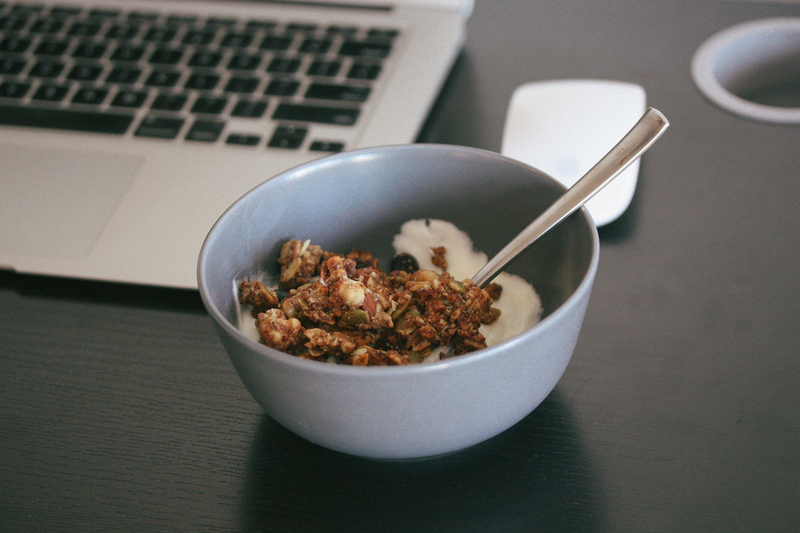 Honestly, I can’t say enough about this granola. I’m so stoked to finally find a product that isn’t laced with canola death oil and packed with sugar and carbs in the form of oats. 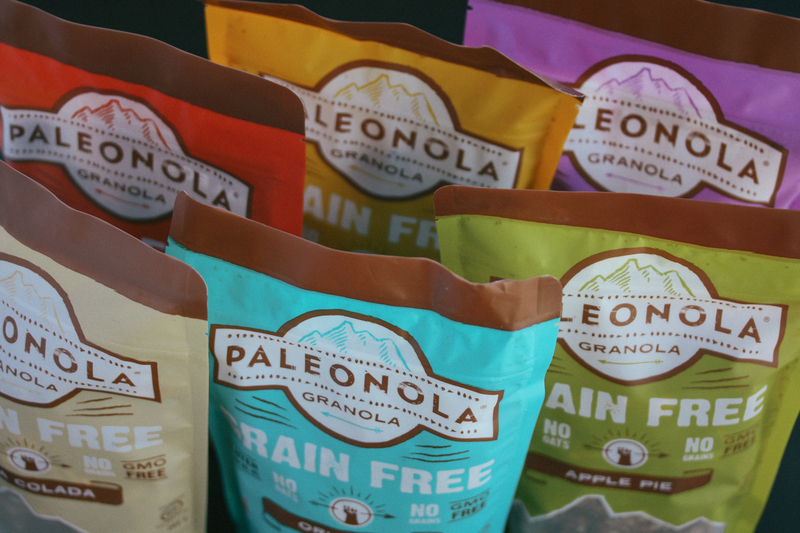 I’m too lazy to make this kind of granola myself – so that’s where I love that Paleonola made all these different flavors so I don’t have to. It’s not terribly more expensive than the others, so all around it’s a win win. My only issue is that it’s not in more stores. I wish this was already on the granola aisle that I pop down at my grocery store, but it’s not (yet). I know I’m gonna be pretty impatient waiting for it to ship when I run out of a bag. In the very least maybe they’ll get on amazon and I can get them same day shipping because I’m buying over $35 dollars worth! 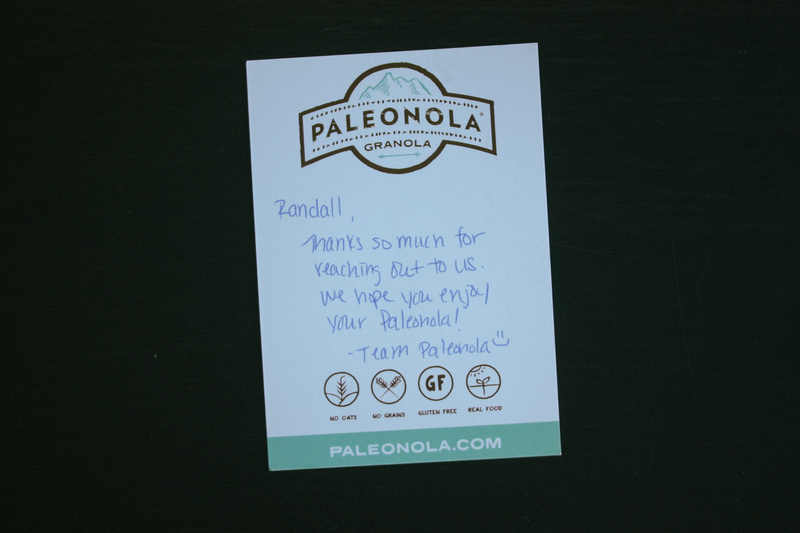 Thank you Paleonola for helping me with my problem – I no longer have to search for grain free granola or make my own. You’ve got me covered! 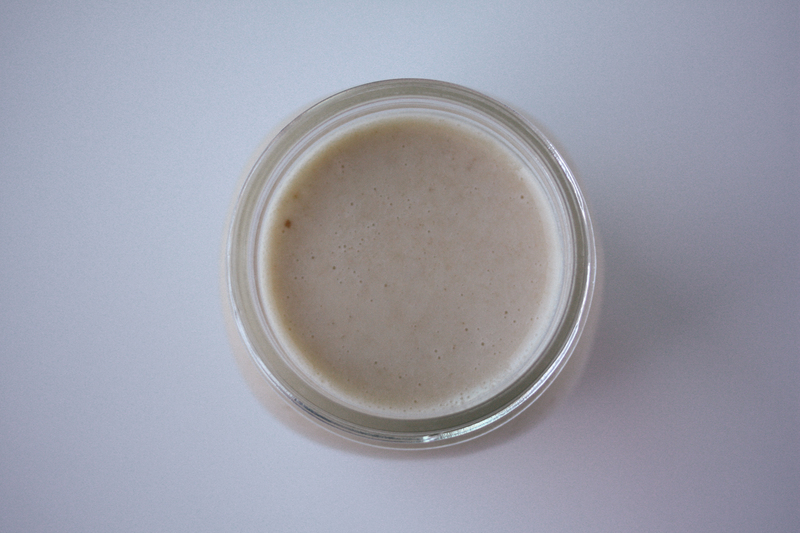 If you would like 20% off your Paleonola, feel free to use this link!